A utility entrance leads to the garage for dumping buckets of earth into a custom trailer. Knowing the correct on/off pattern for a series of 12 switches would trigger a four-inch concrete wall to retract, revealing a subterranean maze of rooms. There’s no furniture, but the main room is spacious, cool and fully lit. A dramatic ‘bathroom cupboard’ entrance makes a big impression on first-time visitors. A third exit connects the opposite end of the shelter to the family’s laundry room/pantry. Kenley always sidestepped questions about the contents of the safe installed on this level. A display of fossils Kenley dug up during the excavation process are the highlight on this level. This level included an office where Kenley often took advantage of the tomb-like silence to grade his students’ papers. The naturally refrigerated lowest level is perfect for storing grain. Descending on hands and knees down a hidden passageway toward a bright light sounds more like a near-death experience than an evening dinner party at a professor’s house. As I tried to hold claustrophobic panic at bay I concentrated on the pay-off at the other end of the tunnel. Floor after floor of secret, bomb-proof living space, engineered and built by one dedicated (some would say obsessed) man. Like hundreds of Trinity Western University (TWU) students before us, our group would get a hair-raising tour that would put our own doubts about the fabled bomb shelter to rest. The whole experience was like a kid’s first trip to Disneyland overwhelming, exhilarating, and little hard to contextualize. Standing four storeys under a house listening to a staid university professor tell the tale of how he once passed out while painting his bomb shelter with the same stuff they use to cover the insides of nuclear reactors will do that to you. The fable of former TWU business professor Kenley Snyder and the mammoth fallout shelter he single-handedly built beneath his Blaine, Washington rancher is the grand-daddy of all ‘you-have-to-see-it-to-believe-it’ stories. Kenley passed away in the spring of 1999, but the legend of the legally blind professor and his crowning achievement now a well-documented, bona-fide fact ensures him a unique place in North American lore. It has also earned him a type of quizzical respect among those who witnessed, first-hand, the character traits that drove him to complete such a complex, daunting, and often solitary, task. What was once a clandestine effort became very public in 2003 after Donna Snyder, Kenley’s widow, opened the hatches of the shelter for the world to see via a segment on Secret Passages (a show that runs on the History Channel) and profiles by local TV news outlets. The televised tours served the dual purpose of providing a historical record and advertising the house which was then listed on the online auction site eBay, but sold via a local realtor for $250,000 US. Part of the plausibility conundrum inherent in describing Kenley’s masterpiece is the sheer scale of the project. When most people think of a bomb shelter, they envision grainy black and white U.S. government videos of nonplussed nuclear families scurrying into a basement room the size of Imelda Marcos’ walk-in shoe closet. 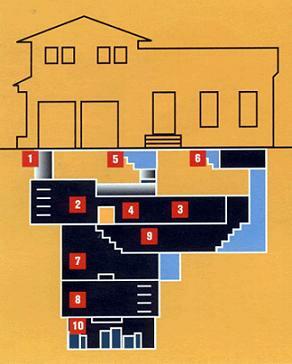 Kenley’s 2,000 square foot, four-storey subterranean hangout is replete with concrete walls and floors that are one metre thick, secret passages, 13 ventilation systems, an ‘electromagnetic pulse wave protected’ computer room, 100-gallon water tank, radiation proof paint, spacious living and storage areas and two ‘secret’ rooms simply too big to fit the construct of the average Jane and Joe’s mind without a little visual help. Though everyone who has seen or read about the shelter recognizes the marvel it is, few, if any, relate to Snyder’s vision. He was definitely a lone wolf (perhaps, more appropriately, a ‘lone mole’). During the 14-year building phase, the Snyder kids would be asked to help out occasionally. But usually they, along with their mother, just stood back and watched the dirt fly. In an amateur ‘how-to’ video that Kenley sold to subscribers of an ‘end times’ journal, he describes the first steps in the process how to build a trailer (to haul dirt) and a bucket and pulley excavation system. He then looks straight into the camera and adds: “So one man can do it himself.” He knew his audience. Being nearly blind, there were a lot of pastimes Kenley couldn’t enjoy. Home-based engineering seemed to meld well with his personality. He would try to schedule his classes early in the day, so he could get home in the mid-afternoon and put a few hours of sweat equity into his project before supper. Alex says his father’s drive to succeed was channeled into the bomb shelter because building it was one activity he could do well despite his limited eyesight. “One thing about being underground like that, nothing is ever very far away,” he points out. To understand Kenley’s impetus to tunnel underground, one should consider the ushering in of the nuclear age and climate of Cold War paranoia that the professor grew up in. In the United States, the actual number of existing bomb shelters is anyone’s guess. According to one expert quoted on the History Channel, the estimates range widely from 1,500 to one million. The shelters are an unknown quantity because of the need to keep them a secret; if a catastrophe happens, everyone is going to come ringing. And, to be brutally pragmatic, there just aren’t enough resources and rooms to keep the whole block going. Keeping things on the ‘down-low’ could avert a dangerous confrontation in the event of a disaster. Kenley’s design even included some tunnels that could be blocked and … well, you get the picture. Despite the doomsday scenarios, Alex Snyder says his father was not really desperate to make his home nuclear holocaust-proof. That idea was merely a practical excuse to help him expend some of his creative energy. “He was a frustrated engineer,” his widow is fond of saying. Kevin Sawatsky, the dean of TWU’s school of business, worked closely with Kenley in the mid-1990s. He says the professor who was one of the founders of the business program left his stamp on the school by tapping into the same drive and vision that helped him complete his seemingly impossible ‘extracurricular’ project. The dean recalls the first time he saw the shelter. He and his wife had dinner at the Snyders’ and were then invited to take the requisite post-dessert tour. Sawatsky had heard a lot about the place already and recalls scurrying down a tunnel to a sterile eight-by-eight concrete room. “I remember thinking, ‘this isn’t much,'” he says. However, after waiting a few minutes for full effect, Kenley then pushed a button that led to the second floor, which in turn led to several subsequent self-contained levels. Like many others before him, Sawatsky quickly changed his mind. People who do things differently especially on the scale that Kenley Snyder did things are often relegated to the fringes. We attach catch-all words (like ‘eccentric’) to them, in order to categorize their complex behaviour. To describe Kenley Snyder as merely eccentric would not do justice to a man whose character, in many ways, had a lot in common with the physical structure below his home. A structure that had many layers, levels that had to be explored had to be seen to really be understood.